1. 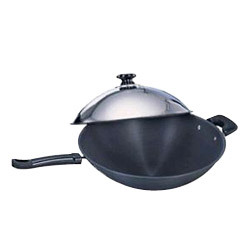 Product name: handy stir-fry pan. 3. Place of origin: Taiwan. 1. Diameter: Ø37cm. 2. Thickness of steel plate: m/m. 3. Single packing (color box) (1) Q'ty: 1 set. (2) N.W. : j 2.1 Kgs k 2.0Kgs. (3) G.W. : j 2.9 Kgs k 2.8Kgs. (4) Meas: 510 x 145 x 430 m/m. (5) Cuft: 1.12'. 3. Packing carton: (1) Q'ty: 5 sets. (2) N.W. : 13.7 Kgs. (3) G.W. : 16 Kgs. (4) Meas: 740 x 526 x 454m/m. (5) Cuft: 6.24'.